The British summer has arrived, and I am never sure how long it will last. We decided to make the most of it by spending the afternoon at the beach. Armed with sunhats and SPF50 we strolled down and found a spot on the sand. Dylan has been to the beach before, but as 6 month old baby in a snowsuit. Today dressed in shorts and T-shirt we visited once again and he really got to discover the wonders. 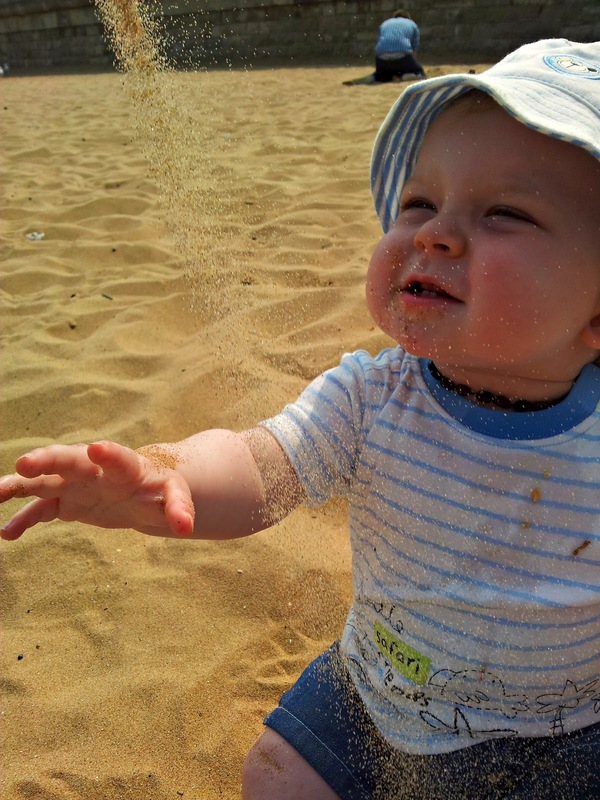 The sand provided endless amusement as he tried to pick some up and watched it fall through his fingers. The cold sea was met with a cry, but safe in mummy's arms he was transfixed by the waves. He is not a huge fan of the sun, and it wasn't long before we retired for an ice cream, which I only managed to get a few mouthfuls of. This is my favourite picture of the day. If you look closely you can see his two bottom teeth, and the top two which came through over the weekend and are only the tiniest little white lines still. He loved trying to catch the sand, and letting it wash over his legs. It even distracted him enough that he forgot he had his sun hat on! 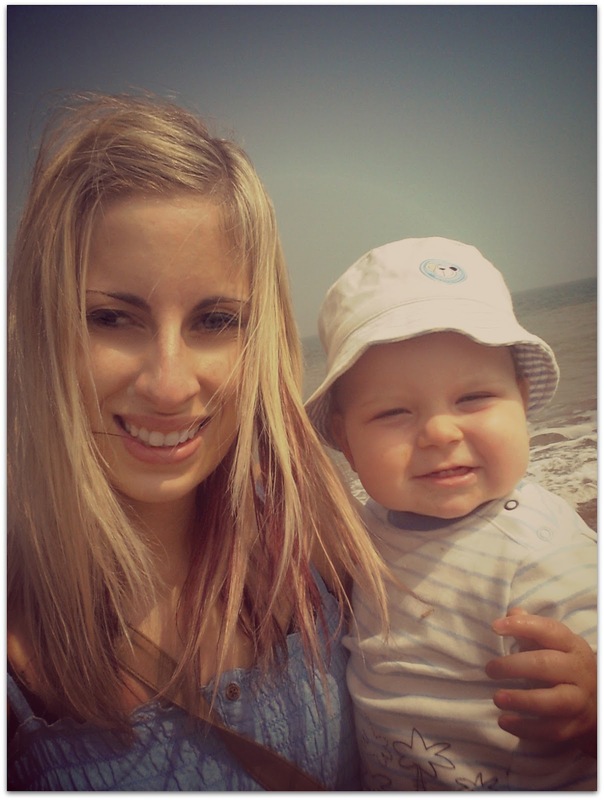 We finally managed to test out the Arbonne Baby Suncream too! 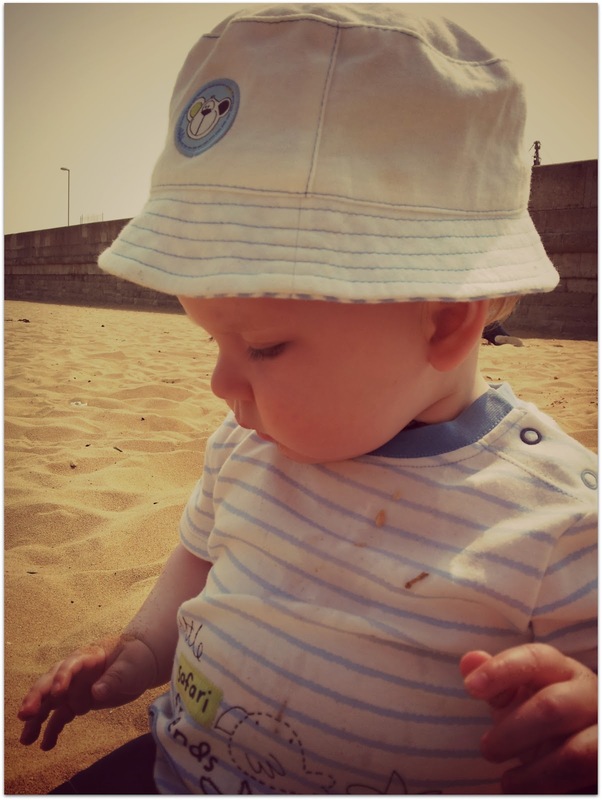 I am looking forward to many more days at the beach, and I'm sure it won't be long until he is ready for buckets, spades and sandcastles. Awww, lovely photos hun. It looks like you had a fabulous day at the beach. Thanks for subscribing! I did see some go in the mouth, so I am waiting for it to reappear in the nappy now. I love to see babies & toddlers in hats like that. Mine at 16m has now decided he quite likes his. I love the last photo too, you certainly can see those teeth. Congratulations on keeping the sun hat on and thank you for linking to Country Kids. What a little darling, gorgeous photos. Good to see everyone enjoying the sunshine. Lovely photos, looks like he had a lovely time. Can't wait to take mine to the beach for the first time when we go on holiday in a couple of weeks time!